In my last post I warned about looking too much like a content marketer and losing the personal connection. However, let’s not throw out the baby with the bathwater! The rise of content marketing has produced a number of useful tools for finding and sharing relevant content – perfect for researching and keeping on top of current topics, identifying interesting people to connect with and suggesting related topics. One such app is ContentGems. What ContentGems does is to search the social web for updates, articles and other shared material, based on your criteria, and deliver you the results in a daily email. Once you’ve opened an account (very simple), you’re asked to Create a New Interest. An Interest is whatever topic you’re monitoring – with a free account you can have up to 2 Interests. Then enter some keywords or phrases – the words that are likely to appear in the content you’re looking for. You’re allowed up to 50 keywords per Interest, so don’t scrimp here. If your topic contains keywords that are likely to be misconstrued you can instruct the search engine to ignore certain words. Interests and keywords can be tweaked, and it’s my experience that you’re unlikely to get your keywords right first time. 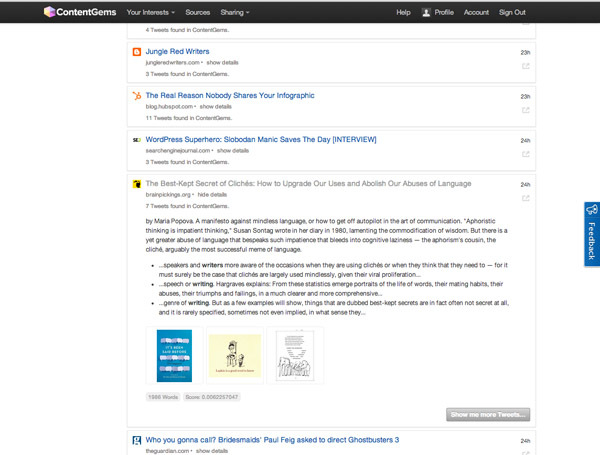 Once you see what ContentGems comes up with you’ll have a better idea of how to refine your search terms. Once you’ve created your Interest and put in some keywords, you can view the results straight away. In this example, I’ve created the Interests ‘Social Media for Writers’ and ‘Poetry’. At first glance I can see I need to refine my keywords! This is useful for finding like-minded Twitter accounts who share your interests. Knowing who has shared an article can also add (or detract) from its authority. 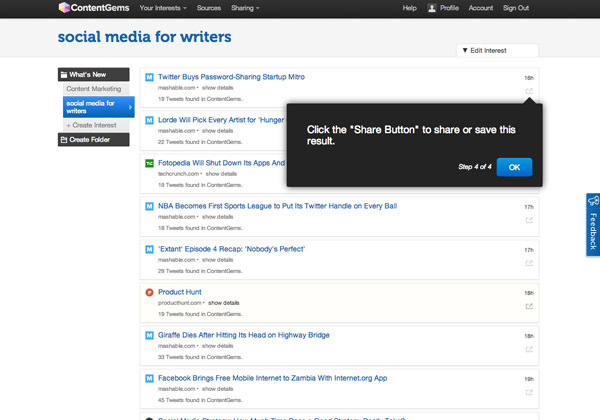 ContentGems scours over 20,000 blogs, newsfeeds and other sources, but you can also add your own sources. 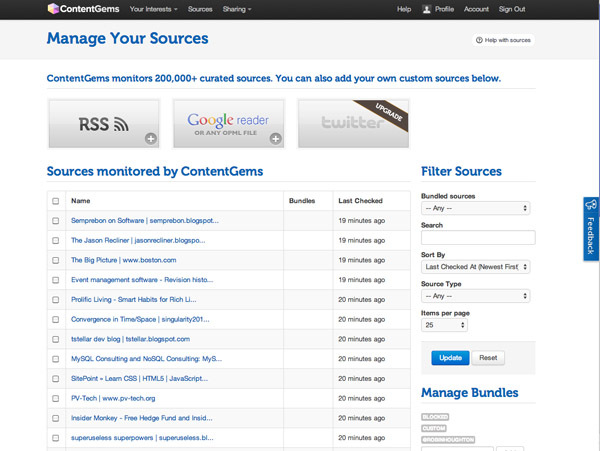 That means you can upload any list of feeds you already subscribe to, and ContentGems will search them for you. 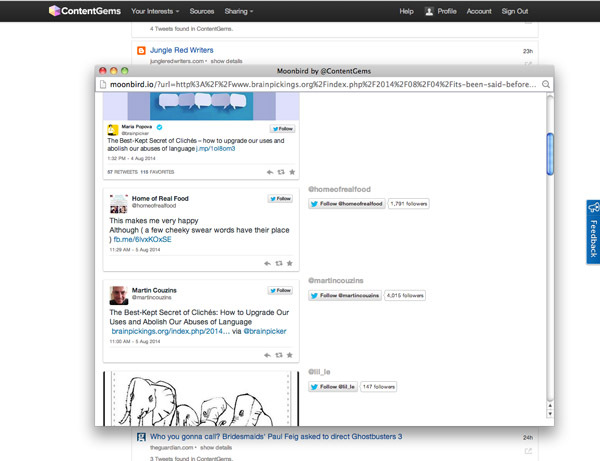 You can also add your Twitter account and ContentGems will index the linked content shared by the people you follow. Each day you’ll get an alert showing you new material matching your Interests. 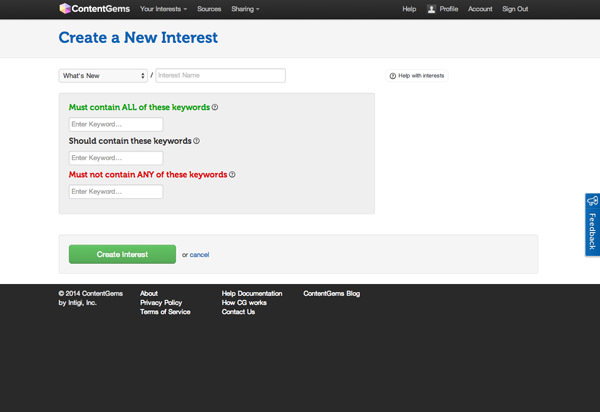 ContentGems is a neat tool – set it up to suit what you’re looking for and tweak as necessary. If you’re using it already, or plan to give it a go, let me know how you get on. I’m always interested to hear of your experiences. Thanks for this post. I want to try this but I was wondering if there was any way of setting up location preferences so I only get news from the UK for example? Hi April. I think you’d have to go to Sources and either create a custom bundle, or you can block sources individually. I’m not sure there’s a way to filter by source location. If you check out the Knowledge Base you will find out more about Sources. Hope that helps.